After a 16-year run on the prime corner space at Avenue A and East Houston, Nice Guy Eddie's closed for this past June 16. Darin Rubell, co-owner of GalleryBar and Ella, is one of the partners opening a new restaurant here. 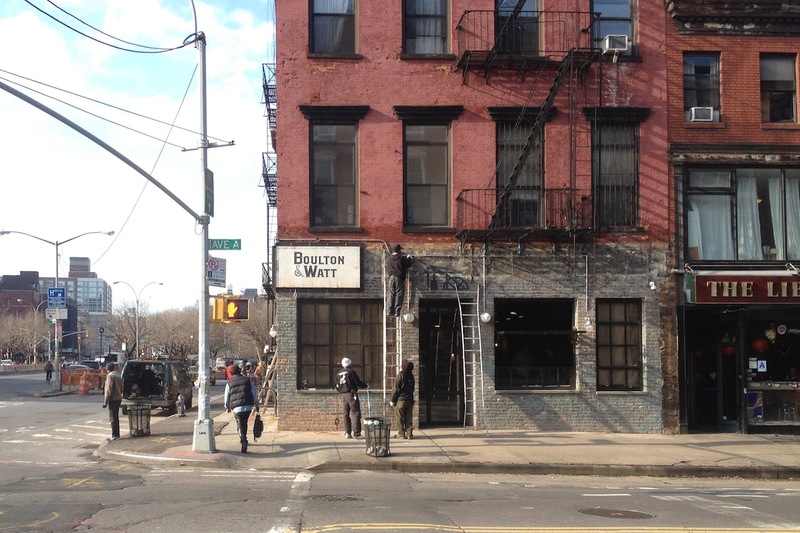 As we first reported in August, the space will be a gastropub called Boulton & Watt, named for the U.K.-based business partners who made many critical improvements to the steam engine in the late 1700s. Whether the place is any good is another story. From the outside it looks like it'd be a chill, low-key spot. But this it is likely not to be. 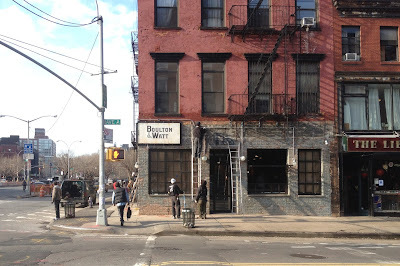 Notice the latest fad for every new old-timey bar or restaurant that opens to call itself "[ ] & [ ]". The trend used to be "The [adjective + animal]". I wonder if that tag was corporate approved and strategically placed. anymore douchey apostrophe'd gastrocrap and i'm gonna lose it. If these guys had one microgram of cool in them, they would have left the mural. I loved how colorful this corner was - a gateway to the EV. So drab and boring now, just like everything else. I'm with Glamma and Goggla, I miss the KISS mural on the wall. And the newly-coined terminology of the day award goes to "douchey apostrophe'd gastrocrap". Fabulous!